For eight years, Swiss watch brand Hublot has had a close partnership with Ferrari. With each new collaboration and co-sponsored racing event, it becomes more and more evident this team is unstoppable. Ferrari F1 machines line up at the starting gate in Monza, Italy. Automobiles and watches have some incredible synergies: Both were born at the turn of the 20th century, and each has evolved by leaps and bounds decade after decade. Today, both luxury cars and mechanical wristwatches are among the most coveted machines on the planet. In addition to technology and mechanics, both strive for precision, performance and excellence. Thus, it comes as no surprise that outstanding watch brands form alliances with top-notch auto brands. In the case of Hublot and Ferrari, that partnership has yielded more than 50 collaboration watches as cutting-edge as Ferrari’s cars. Since joining up in 2011, Hublot and Ferrari teams have worked side by side to create innovative and powerful watches that can withstand the rigors of auto racing. The first watch, created in 2012, was the Big Bang Ferrari Magic Gold made of Hublot’s patented proprietary scratchproof gold. A year later, inspired by the famous LaFerrari supercar, Hublot released the MP-05, with more than 630 parts in its movement, shaped to reflect the car’s engine form and offering 50 days of power reserve—something unheard of in the watch industry. In 2017, to celebrate Ferrari’s 70th anniversary, Hublot unveiled its Techframe Ferrari Tourbillon Chronograph, by Ferrari’s head of design, Flavio Manzoni. In 2018, the Techframe won the coveted iF Design Award for excellence. 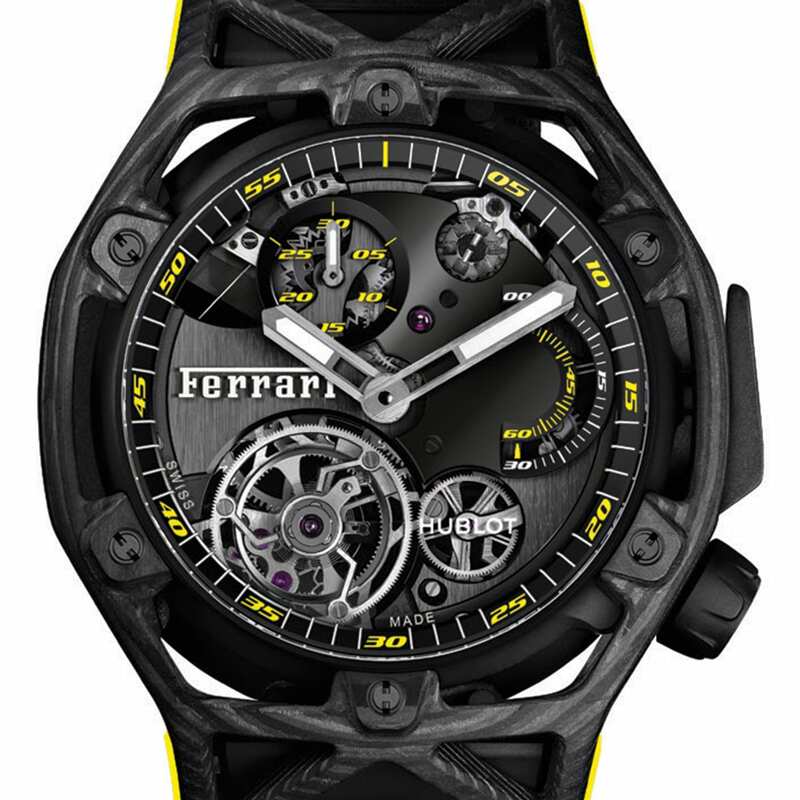 Techframe Ferrari Tourbillon Chronograph Carbon Yellow timepiece, $137,000, at hublot.com. 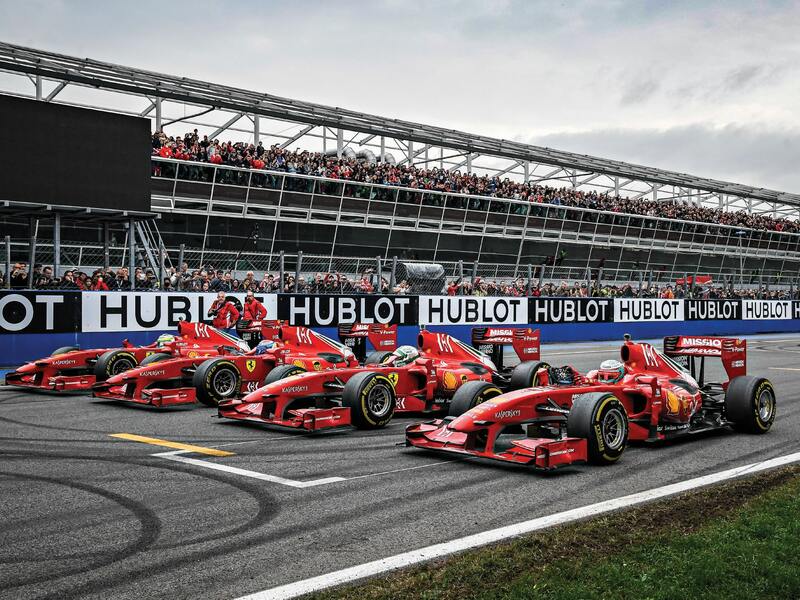 Recently, at Monza in Italy—one of the world’s oldest but most storied racetracks—Hublot was the official partner of Ferrari for the Finali Mondiali motorsports gathering. At this celebration, hundreds of Ferrari owners and lovers transport their cars to participate in races, underscoring their passion for the brand. It is the largest gathering of Ferrari cars in the world, with well over 300 Ferrari styles showcased. During the weekendlong festivities, Hublot also showcased the Techframe Ferrari Tourbillon Chronograph Carbon Yellow watch. The $137,000 timepiece houses the HUB6311 Manufacture manual-wind skeletonized movement with Tourbillon and chronograph. Additionally, Hublot recently unveiled a special 25-piece U.S.-only Big Bang Scuderia Corsa timepiece for $34,600, with a case that marries carbon fiber and the brand’s proprietary red ceramic composite material.